Last week, the Council agreed to allow Main Street of Hope to move forward with the grant application for $538,000. The local not-for-profit group is working with Administrative Resources Association to put together the application. 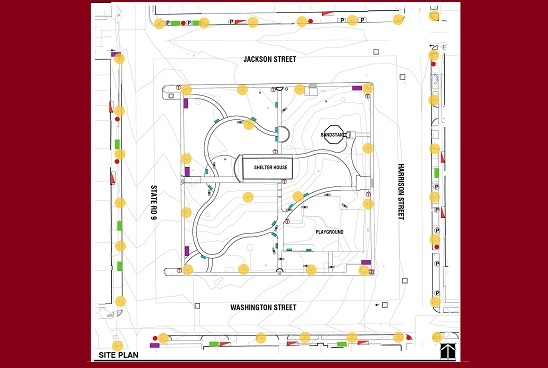 The main features of the proposal are a series of improved trails and sidewalks in and around the park, along with new light poles in and around the Town Square. The lighting portion of the plan has been the most discussed at public meetings. At issue was whether to pay a higher cost for lights provided and maintained by Duke Energy, all as part of the contract, or to go with an outside provider that is cheaper but would not make the repairs as part of the initial project. Ultimately, the decision came down to the cost of the project and the desire to have metal poles that are more historic looking. The project will replace 43 lights in and around the square, with brighter and more energy efficient lights that will also look more historic. The Duke proposal would have cost about $314,330 under initial estimates, while an outside vendor would cost about $194,500. The second big expense of the grant application is to revamp the trails and sidewalks around the square. The goal is to make them ADA accessible. Councilman Ohmer Miller raised some concerns about that portion of the project, wondering if the new paving would be strong enough to withstand some of the heavy vehicles that move equipment and booths into the Town Square during Heritage Days. The council agreed that vendors' insurance must cover any damage to the sidewalks. The landscaping, sidewalks and trails are estimated at about $93,800 with $22,500 for other amenities such as new wayfaring signs, benches, trash cans and cigarette catchers. Construction mobilization and demolition are estimated at about $71,000 and soft costs are estimated at about $153,000. The total would be about $538,000. All of the figures are just estimates and would become more solid if the grant is approved and aspects are put out for formal bidding. Councilman Clyde Compton also raised questions about the town's share of the costs for the grant. Susan Thayer-Fye, executive director of Main Street of Hope, estimated that the local match would be about $111,700, with a state grant of $430,815. The Custer-Nugent Foundation has already agreed to donate $25,000 toward the project while the landscape architect, Joe Dodd, is a former Hope resident and is agreeing to donate his fees for design work. Thayer-Fye said that the goal is to find other partners willing to donate toward the project, but no matter what, the town will have to have some "skin in the game." At the time the grant is applied for in late June, all of the founding sources for the local matching grant must be identified, she said.